Support for indefinite human life extension is a powerful, intellectually compelling, intuitive position. The best minds will arrive at it on their own, often quite early in life. The sheer injustice of a forced termination of life for a person who has committed no crime and harmed no fellow humans is enough to make a person of intelligence and decency recoil and resist. Yet the society immediately surrounding the thoughtful proponent of indefinite life extension often does not agree. Culturally ingrained acceptance of “natural” death – be it the result of religion, tradition, Malthusianism, status quo bias or plain resignation – still has a hold on the majority of people. Often this leaves the forward-thinking critic of senescence and death feeling isolated and discouraged. But it does not have to be this way. With the Internet, geographic separation no longer implies a separation of contact. Thinkers from around the world, who have independently come to the same realization regarding the supreme injustice of mandatory death for all, can find one another, share ideas, and cooperate toward achieving radical life extension in our lifetimes. But to cooperate effectively, we need an effective way of knowing how many of us there are, what our fellow friends of long life are able to do and have accomplished already, what discoveries and breakthroughs scientists are releasing into the world, and where we can invest our own talents to accelerate the arrival of a time when increasing life expectancy will outpace the advent of senescence. This is where the Movement for Indefinite Life Extension (MILE) comes in. The MILE Facebook page offers a way to gauge awareness of and support for indefinite life extension. 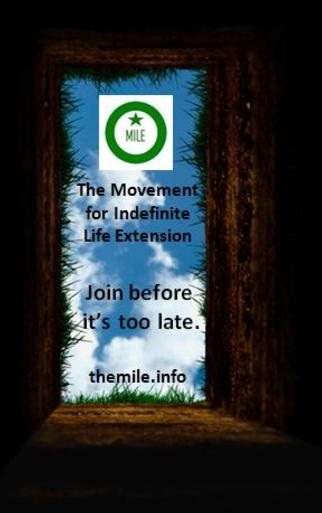 One of the easiest and most important ways you can begin to make a difference in helping bring indefinite life extension about is to (1) go to the MILE Facebook page, (2) like the MILE on Facebook, (3) read and share the many informational, scientific, and philosophical pieces made available daily on the MILE page, and (4) spread the word to your friends and acquaintances who are already sympathetic to indefinite life extension. The MILE aims to identify how many of us throughout the world already support indefinite life extension. Once this base of supporters is established, it will become easier to expand it by reaching out to others and spreading awareness that medical science may put the greatest triumph of all within our personal grasp. The MILE seeks to increase its supporters by an order of magnitude every year. The July 1, 2012, goal of 80 supporters was easily met. By July 1, 2013, the goal is to accumulate 800 supporters. By July 1, 2017, if the MILE can achieve 8 million supporters, we will have a critical mass of people to catalyze massive societal change – from investment into life-saving, life-extending research to political reforms that ensure that obsolete restrictions and special-interest privileges do not stand in the way of medical progress. The MILE has fewer than 300 supporters left to reach its proximate goal. If you have not already spent five seconds going to the MILE Facebook page and clicking the “Like” button, I encourage you to do so at the earliest opportunity. If you have done so, you have my thanks and the thanks of all of us whose eventual long-term survival may be bolstered by your increment of support. We welcome and encourage your support in spreading the word to others who have already arrived at the realization that achieving radically longer lives is an urgent moral imperative. Surely, there are more than 800 of us out there already. We want to find out about and empower every person who has ever discovered the importance of indefinite life extension, so that the brilliant spark of aspiration will never be extinguished in any such thinker from lack of fuel. There is more that you can do to show your support for indefinite life extension. 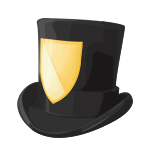 Badge awarded for being a supporter of extending human lifespans beyond any fixed limit. 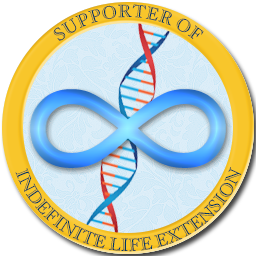 * Get the free Supporter of Indefinite Life Extension Open Badge. * Read and watch an abundance of Resources on Indefinite Life Extension. * Write articles, create videos, and engage in regular discussions on this vital subject. * Run a distributed computing project, such as Rosetta@home, Folding@home, and World Community Grid. * Come up with opportunities for education and activism that will help spread awareness of indefinite life extension and encourage widespread support. No matter who you are, or how new the ideas of indefinite life extension are to you, we would be delighted by your participation in the MILE and look forward to welcoming you as a valuable ally.